We’re still a few years shy of the 30-year anniversary of legendary indie label Sub Pop, which started in 1988. But why wait? We’re calling out 27 of our favorite Sub Pop albums that you can download now on Amoeba.com. Browse all of Sub Pop’s catalog that we have available here. Remember the whole Pixies/Breeders/Belly/Throwing Muses web of bands many years back? Or, more recently, the Wolf Parade/Sunset Rubdown/Frog Eyes/Handsome Furs/Divine Fits band sprawl? And let's not even get into Broken Social Scene. 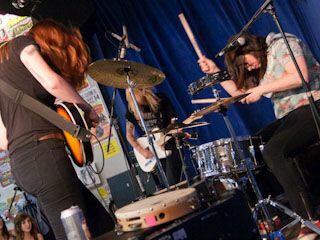 Well, none of these band associations holds a candle to Vivian Girls and the myriad bands, collaborations, side projects and what-have-yous that spring from the New York noise pop band. In light of recent release from onetime-Vivian Frankie Rose and the upcoming release by Vivian girl Ali Koehler in Upset, I've attempted to make a Vivian Girls tree for y'all. I'm sure I missed like 20 bands, let me know if I have!